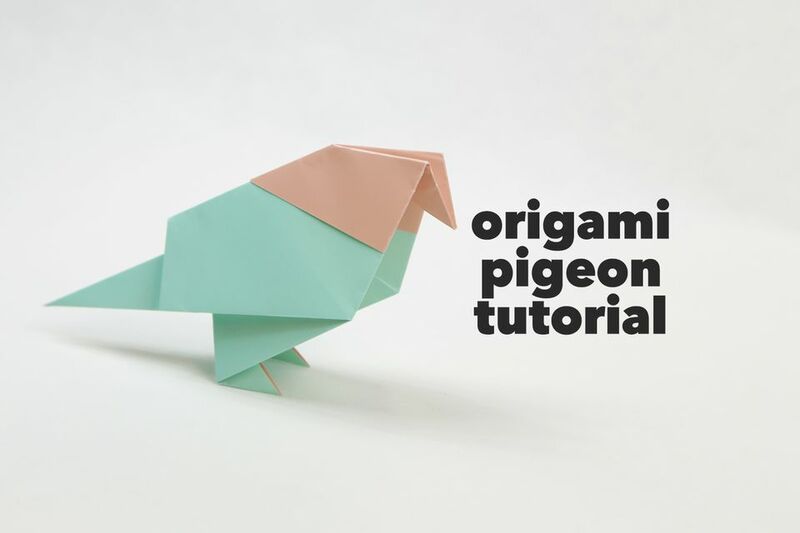 Learn how to make a cute little origami pigeon or chick! This traditional model is very straight forward to make, and resembles lots of different birds! This origami bird takes only about 5 minutes to make and is easy to remember, meaning you can make quite a few of them quickly and make a whole family of pecking pigeons! For the tutorial I used some really nice origami paper from the pack 'Pastel Colors' by Tuttle. It's a little shiny and thicker than most origami paper, making the model quite sturdy. Buy it online here. I would suggest using paper that is about 15 x 15 cm to start with. Start with the colour you'd like to see on the head facing up. 1. Fold the paper in half diagonally, left to right and unfold. 2. Fold the right and left corners inwards aligning with the central fold. 3. Fold the top section down to the left. The top point will meet the left point. Unfold. 4. Repeat on the top left section and unfold. 5. This is what you should have. Flip the model over, left to right. 6. Fold the top section down. 7. Flip the model back to the other side. 8. This is what you should now have. 9. Open out the right flap. 10. Reverse the folds there and flatten the side again. Repeat on the left. 11. Fold the both of the flaps down and out to the sides and flatten. 12. This should be the result. 13. Fold the flaps out a little, to make the feet. Fold the model in half, left to right, flatten it out. 14. Rotate the paper to the right. 15. Fold the 'tail' to the right edge. 16. Fold the tail back to the left, leaving a small gap, keeping the tail aligned at the bottom edge. 17. Open the bird out again, and reverse the folds you just made. 18. The tail should look something like this. 19 Fold to 'beak' down to the right, you can play with the angle for different types of birds. 20. Reverse the beak inside and flatten it out. 21. It's complete and should be able to stand up on it's own. The origami paper is from the pack 'Pastel Colors' by Tuttle. Buy it online here.